Sign up for Sorauren Park News and follow @SoraurenPark on social media for the latest news on the expansion of the West Toronto Railpath and links to Railpath groups. The West Toronto Railpath is an exciting project to create a multi-use trail along the eastern edge of the Metrolinx Kitchener GO rail corridor that runs beside Sorauren Park. The northern part of the trail, from the Dundas/College bridge north to Cariboo Avenue, was completed in 2009. Plans are well under way to complete the southern portion, from the Dundas/College bridge past the park to Queen Street and eventually Stanley Park, connecting to the new pedestrian/trail bridge crossing the rail lines into Garrison Common/Fort York, and hence to the waterfront. How does it affect Sorauren Park? To continue the trail south, a pedestrian/trail bridge must be built to cross over the Barrie GO line, near No Frills. 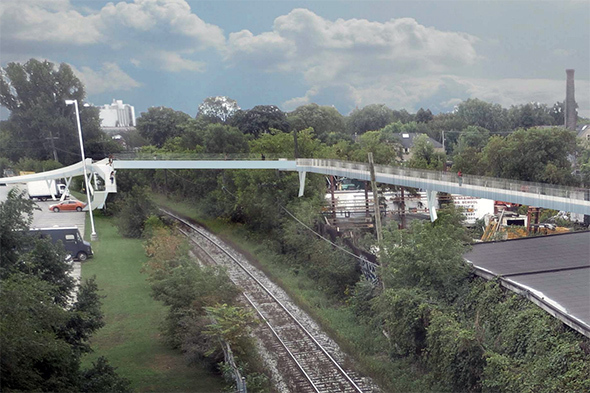 The opportunity exists to create a spur off the top of the pedestrian/trail bridge into Sorauren Park, connecting the west side and east side of the tracks with a multi-use trail. 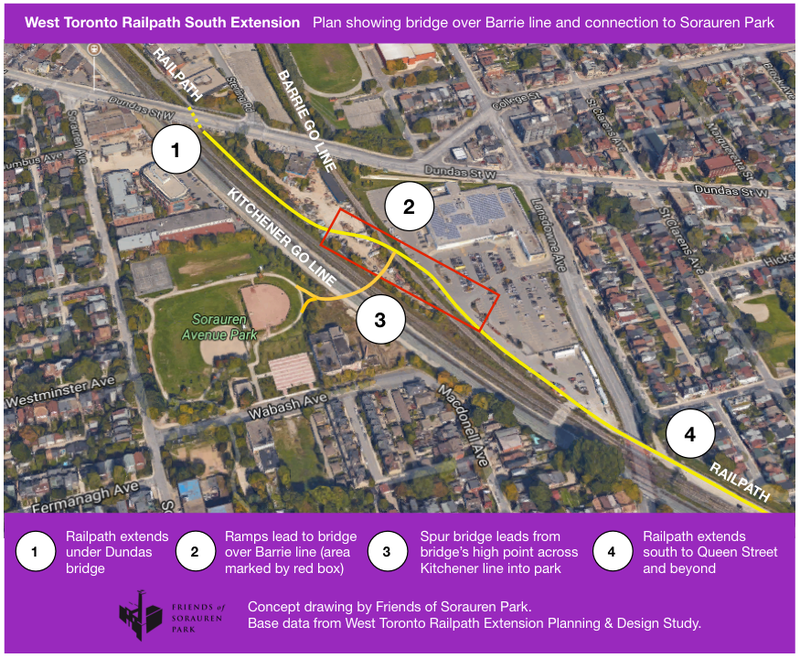 The 2014 West Toronto Railpath Extension Phase 2 Planning and Design Study included designs showing the opportunity for connecting Sorauren Park. Metrolinx and the City of Toronto are working on the Railpath extension. Many community groups, including the Friends of the West Toronto Railpath, are advising the planners. It’s important for residents interested in the connection to Sorauren Park to attend community meetings and make your views known. Meeting notices will be posted on SoraurenPark.com, on our social media feeds @SoraurenPark (Facebook, Twitter, Instagram) and through our email newsletter. Help stop carcinogenic diesel particulate matter from getting into the lungs of Sorauren Parkers on rinks, playing fields and at the dog park! The Roncesvalles-Macdonell Residents Association has launched a petition on Change.org to electrify the Union-Pearson Express diesel train service that will start running beside Sorauren Park next year. You can sign the petition here. 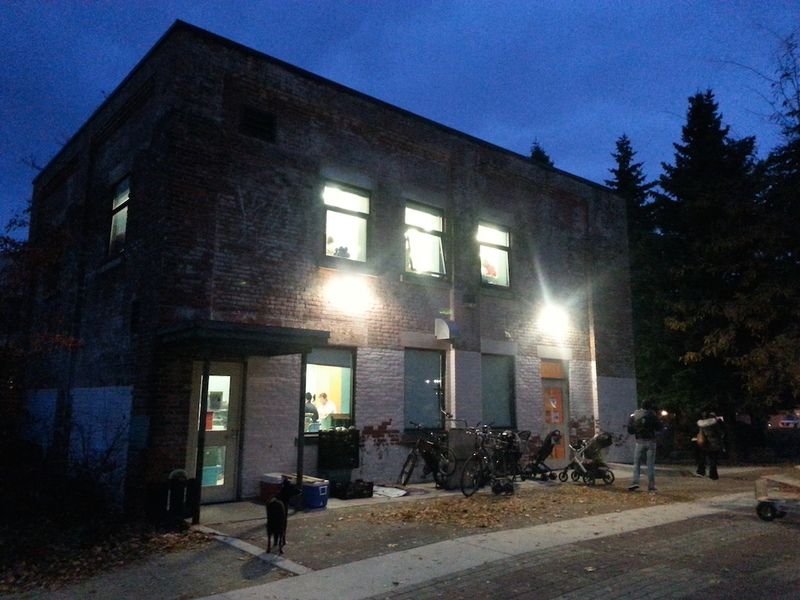 The RMRA, the Wabash Building Society, the Weston Community Coalition, the West Bend Residents Association, the Junction Triangle Residents Association, the Mt. Dennis Residents Association, the City of Toronto, the Toronto District School Board, the Chief Medical Officer of Health, the Professional Engineers of Ontario, the Clean Train Coalition, the Asthma Society of Canada, the Canadian Association of Physicians for the Environment, the Canadian Cancer Society – Ontario Division, the Toronto Environmental Alliance, and many other groups have been calling for electrification of the service for years. Despite these protests, health evidence, environmental evidence, and economic evidence to the contrary, the Ontario Liberals decided to build a diesel service in time to serve tourists during the two-week Pan Am Games. Following the Games, the UP Express will be an expensive express train service for the downtown business class, with one-way fares expected in the $25-$35 range. While the protests forced the Liberals to initiate an environmental assessment on electrification, it was delayed by several years, giving time for the diesel system to be installed. As well, there is no funding in place for electrification, even though Metrolinx’s own preliminary studies show that an electric system will be cheaper to operate than diesel. You can read an open letter to Premier Wynne covering these and other points, with links to relevant sites, here. 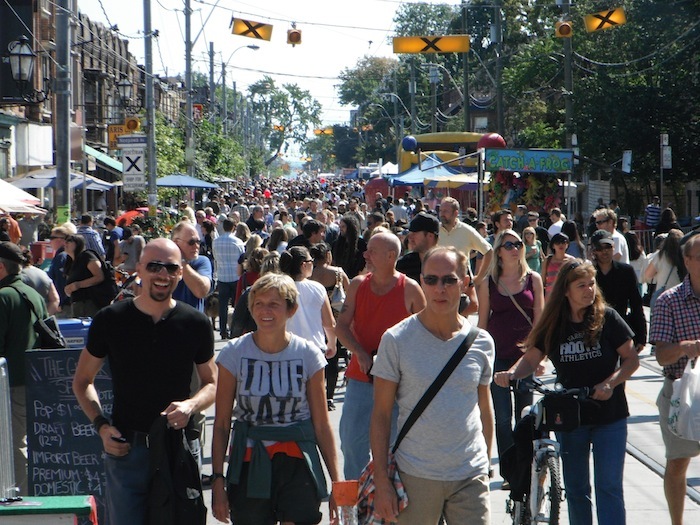 Come to the Roncesvalles Polish Festival this Saturday and Sunday, Sept. 14 and 15, and make sure to drop by the Wabash Building Society booth to learn about the latest developments at Sorauren Park. We’ll have news on Sorauren Town Square construction, with Phase 1 expected to start only weeks away in mid-October. What encompasses Phase 1? Find out at the booth! Also learn more about the Metrolinx noise walls, join the winter rink team, find out about Sorauren Stargazers, and more. We’ll be there both days from approximately 11 a.m. to 4 p.m. with maps, drawings, hand-outs and great conversation. Enjoy the Festival! Metrolinx/GO Transit has set Sept. 17 as the date for a public presentation of its proposed noise walls for Sorauren Park and area. The walls are proposed to mask the sound of increased diesel train traffic on the Georgetown rail corridor beside the park. 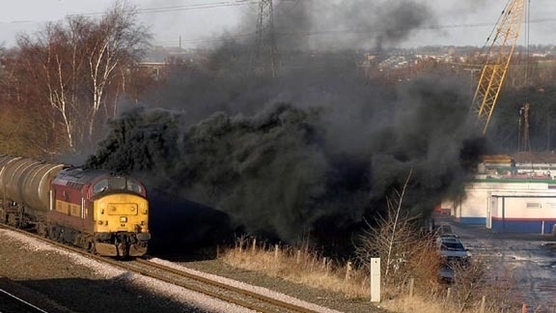 Carcinogenic diesel rail traffic is planned to increase eight-fold over the coming years, from approximately 50 to 400 trains per day to serve the growing suburbs and the new rail link to Pearson airport. Tuesday, September 17, 6:00 to 8:30 p.m.
Community advisory committees have expressed serious reservations about the Metrolinx wall proposals. Some designs will become graffiti magnets, and community proposals to explore “living” green walls were dismissed. Some voices have also asked that no walls be built in certain areas until the true traffic and noise conditions are understood, especially in the context of proposed electrification of the rail corridor, which would introduce quieter, lighter, faster, non-emitting and cheaper-to-operate trains. More details including updated sketches of the proposed walls will be posted once available. 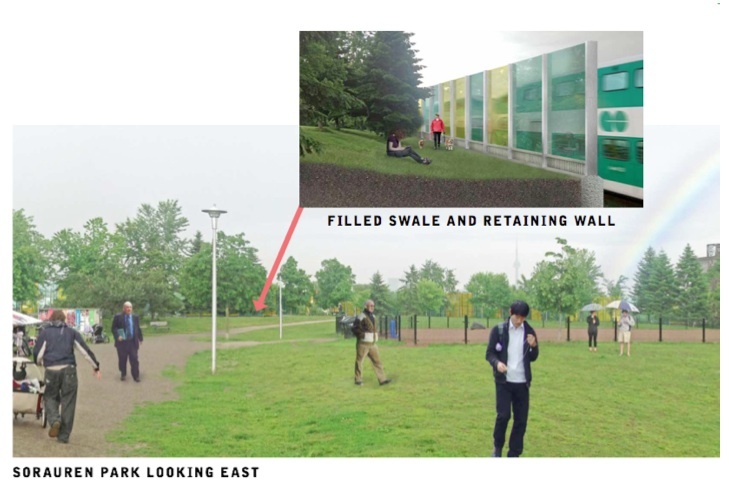 Landscape architects on contract to Metrolinx are proposing a transparent, multi-coloured acrylic noise wall for the park along the rail corridor. The rail corridor is being expanded to accommodate the new Union-Pearson Express diesel rail link to the airport, and an increase in regular diesel GO train traffic. Provincial regulations require noise walls due to the increase in loud diesel train traffic. Metrolinx predicts traffic to increase from about 50 trains per day currently to approximately 200 per day by 2015, and more than 400 per day in the years afterwards. The acrylic noise walls were presented this month to the community advisory committee providing input to Metrolinx. The full presentation can be found here (pdf). More information on the community advisory committee can be found here. A full public meeting will be held in September to present refined designs. 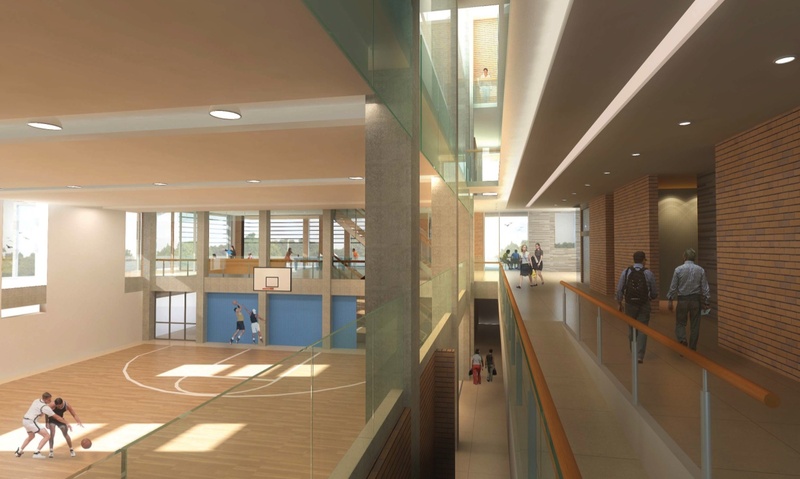 The 16-foot-high acrylic walls would extend from the edge of the condos north of the park, south across the entire east side of the park, continuing behind the future community centre and the east end of Wabash Avenue. A different design—precast concrete with transparent top ribbon—would continue south of that point, behind the homes on Macdonell. Metrolinx has also proposed filling in the existing swale between the top of the berm in the park and the Metrolinx property line, marked by the existing chain-link fence (see illustration). But no decision has been made on the swale. Members of the community advisory committee have told Metrolinx that the view from Sorauren Park is an important feature worth preserving. At the same time, members are concerned about graffiti on the walls. The City of Toronto has ruled out willow-based “green walls” primarily because of ongoing maintenance costs and less-effective noise mitigation. What do you think? Would these walls invite graffiti? Would vine-covered walls be preferable? Maybe a combination of the two, so kids can still watch the trains through “windows” in the wall? Should the swale be filled in? Should it be filled in high enough to create a better toddler toboggan hill? Should the “no wall” option be explored pending further discussions on electrification and real vs predicted noise levels? Feel free to use the Comment function below to join the conversation. Also watch for news of the September public meeting… sign up for the Sorauren Park News email newsletter, and follow us on Twitter. For related stories on the rail corridor including the fight for electric rather than diesel cancer trains, click here.